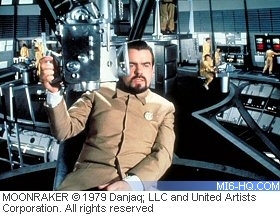 James Bond confronts billionaire industrialist Hugo Drax, who plans to destroy life on earth and establish himself as king of a super-race in outer space. A space shuttle is being transported on the back of a 747 which is hijacked with the plane being destroyed and the crew being killed. Bond is called in by M, who is up to no good with an air stewardess. The pilot disables the plane whilst she produces a gun. A fight entails and the pilot who is wearing a parachute gets thrown out. Jaws then appears and pushes Bond out. 007 has no choice but to catch up with the pilot and take his parachute. In the meantime, Jaws has managed to catch up with Bond and wants a piece of him. Bond pulls his own ripcord and returns to ground safely, whilst Jaws crash lands in a conveniently placed circus tent. 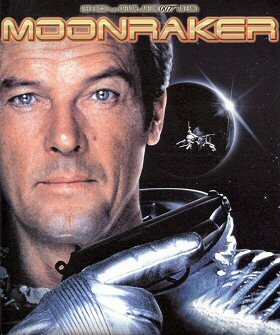 As well as being the title of Ian Fleming's third novel, Moonraker is the moniker given to the space shuttles owned by Sir Hugo Drax. According to writer Tom Mankiewicz there was a scene featuring Drax meeting his co-financiers in the Amazon lair; they use the room located just below the space shuttle launch pad that Bond and Holly later escape from. This scene was shot but later cut out. Theatrical trailer includes a close up reaction shot of Jaws after Bond punches him in the face aboard Drax's space station. The shot was not seen in the finished film. A scene involving Bond and Holly inside what appears to be a meditation room aboard Drax's space station, was shot but never used in the final film. Shots of this scene made its way into some of the press stills as well as the trading cards released by Topps in 1979. Q: "I think he's attempting re-entry sir." When Corrine Dufour is running away from nasty biting dogs her footwear changes from bright sandals to, one second later, dark boots. 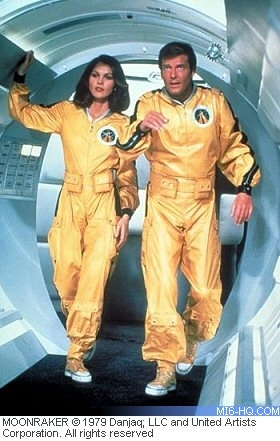 The only film in which JB goes into outer space. THE END of "MOONRAKER" James Bond will return in "FOR YOUR EYES ONLY"